How would YOU reboot Ever After High? Would you? Unlike Monster High, I don't see Ever After High as having any sort of G2, as the new-look dolls don't really count for me. It was officially ended before Monster High, having a few TV specials under its belt and quite a few doll lines. I see this line even more rarely than MH (I actually saw a playset for Epic Winter in B&Ms! ), and I think books were the last item to come out for this? If you had the chance to reboot or relaunch Ever After High, regardless of budget, would you? HOW would you do it? Re: How would YOU reboot Ever After High? Would you? I was always more into MH than EAH, but i'd say i would add some more characters based off some lesser known fairy tales, maybe a fan contest where they could vote for the backgrounders to have a doll release. I would do like MH did and also have some fashion packs. And maybe some more creatures available, the few animals i saw were all...clunky looking. I would try to schedule the release of the webisodes that promote the dolls more consistently with when the dolls are actually released. Like remember when the short that showed off Winter Apple and Maddie was released two months after the dolls came out or something? That was dumb. Also, I would release Daring's signature doll in wave 2 at the latest. As a character he was the boy with the most ties to the other characters and in hindsight it boggles my mind that he wasn't released sooner. Maybe put him in a two pack with Dexter or something, I don't know. On a more thing I just really wanted out of EAH before it kicked the bucket, I would have a Sparrow Hood doll made. With rooted hair, nice accessories, and proper articulation. Honestly under my rule, every EAH line would have Sparrow Hood included, he'd be the new Holly. Then I'd be fired for causing the line to fail a second time. I would like to see a lot more of the boys get dolls. 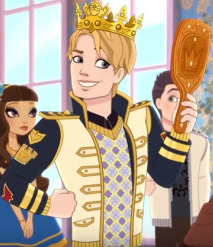 I think with Ever After High I'd just go back in time and re-do everything from Epic Winter on. The outfits weren't bad (at least the animated designs), but they lacked detail and those awful molded on tights were a giant mistake that hurt sales as much as they saved costs. I'd also get rid of all the gimmick dolls and give us the special edition Holly we deserved in place of the sad molded-on top hairplay Holly. I still miss EAH so much. I wish it had stayed how it was at the beginning when the dolls and their outfits matched exactly to their animated counterparts. I liked the original headmolds before the change. I loved the detailed accessories. I guess if I had full control over a reboot I'd probably market and produce them as more higher end collectibles in order to retain the quality of the figures. I might consider aging the characters up to early 20s rather than teens. I wouldn't change their look, just the HS setting & drop them more into that fantasy fairy-tale world. I'd definitely loose the overt obsession with fashion some of the characters displayed. (They can still have awesome clothes and dress for events and have doll or fashion pack releases corresponding to those without some of the somewhat cringe-y lines that occasionally popped in the webisodes.) No molded on clothes or hair. No budget lines. Focus on good stories, adventures, and character interaction and match the merch. to it. I still adore the animation style and would keep the webisodes + specials format and style but would have the specials at least available on DVD. Sparrow would get a doll!!! There were so many characters that I would have loved to see as dolls, like Ramona Badwolf, Lilly Bo Peep. Helga and Gus Crumb would have been an AMAZING two pack! And I'm seconding the idea of more boys. We needed a Sparrow Hood, Hopper Croakington II, Humphrey Dumpty, maybe even a Chase Redford. I'd also like to see a proper Daring Charming. You know, no molded on stuff. Something that I think would have made the line especially interesting would be to eventually show the narrator Brooke Page and make her a student. I think a lot of fun could be had designing her. She could be encompassing of the general fairy tale theme, and maybe have a dress inspired by an old fashioned story book. As for making her a doll, I think it would make sense to release her a SDCC exclusive, that way a lot more effort could be put into her.